The HDM44-18G-HDMI supports the latest in display technology. HDMI 2.0 version (Supports HDMI2.0 4K50/60Hz YUV444 / YUV420 1080P, 1080i, 720P and standard video format.). LED indicators to show power status. 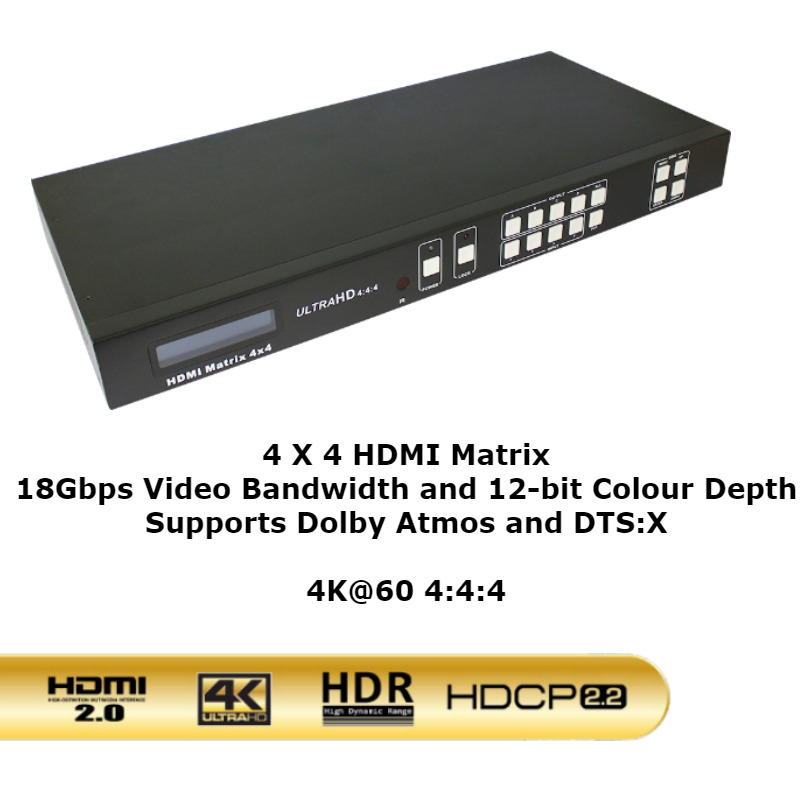 Support Panel Buttons, Local IR, RS232 Control, IP Control Via web GUI, and PC Software. 1U rack design, easy installment. This Simple to use 4K HDR 4 x 4 HDMI Matrix allows you to send up to four HDMI sources to four HDMI input displays. 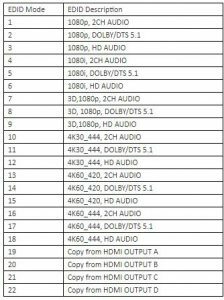 It will support resolutions up to?the full 18Gbps 4K 60 Ultra HD 4:4:4 and supports high resolution digital audio formats such as ?LPCM 7.1CH, Dolby TrueHD, Dolby Digital Plus and DTS-HD Master Audio. Perfect for locating you video components such as MySky box, Bluray players, Apple TVs, etc in a central location and then distributing them out to multiple TVs around the house or office. Can the sources at the TV location with the supplied with an IR remote control. ?LCM:?Display the information of each input and output setting and EDID management. ?IR:?IR Receiver window (accepts the remote control signal of this device only). ?POWER:?Press this button to power the device on/off. The LED will illuminate green when the power is on, red when it is in ‘Standby’ mode. ?LOCK:?Press this button to lock all the buttons on the panel, press again to unlock. ?OUTPUT/INPUT:?Press the OUTPUT and INPUT button to select the output corresponding input. ?For example?Press OUTPUT ALL > INPUT 1, The OUTPUT A, B, C, D will be set to INPUT 1. Press the PTP button, The OUTPUT A, B, C, D will corresponding INPUT 1, 2, 3, 4. EDID:?Smart EDID management, the LCM will display the EDID operation. Press the MENU button enters the EDID management window. Press UP or DOWN button to select the needed EDID setting. Press the?ENTER button to download EDID into the input source, it can easily download any EDID setting to an input port. TCP/IP:?This port is the link for TCP/IP control and connects to an active Ethernet link by an RJ-45 cable. RS232:?Connect to a PC or control system by D-Sub 9-pin cable for the transmission of RS-232 commands. 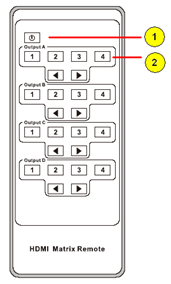 HDMI INPUT:?Connect to the HDMI sources device such as a DVD player or a Set-top Box by HDMI cable. 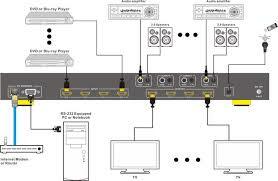 AUDIO OUTPUT:?The coaxial and L/R audio output to audio amplifiers or speakers. HDMI OUTPUT:?Connect to HDMI equipped TVs or monitors. IR EXT:?If the front IR sensor of unit is obstructed or the unit is installed in a closed area out of infrared line of sight, the IR RX receiver included can be inserted into the IR EXT port at the rear to extend the IR sensor range and enable local control of the matrix. DC POWER INPUT:?Connect to 12V/2.5A DC power adapter. 1.?Press this button to power on the matrix or set it to standby mode. 2. Press these buttons to select output A, B, C, D for input 1, 2, 3, 4 ports.